LAWRENCE — More is better. That’s the core idea that gave rise to the Six Kannon cult in Japanese Buddhism. Then the Seven Kannon cult, and then the Thirty-Three Kannon cult that persists to this day. A new book about the phenomenon, “Accounts and Images of Six Kannon in Japan” (2016, University of Hawaii Press), by Sherry Fowler, professor of Japanese art history in the History of Art Department at University of Kansas, is the culmination of many years of research – including falling off a cliff. Kannon is a bodhisattva — an enlightened being who could achieve nirvana, i.e., total enlightenment and freedom from the cycles of rebirth — but who chooses to remain in the world in order to aid other sentient beings through those six cycles. Kannon is the Japanese name for Avalokiteshvara in Sanskrit or Guanyin in Chinese. Therefore, one type of Kannon is the “Thousand-Armed,” who saves hungry ghosts. Another, whose job is to care for animals, has a horse’s head atop his/her human one. (Kannon may be thought of as male or female.) Still another has 11 heads – typically one human-scaled head with 10 smaller ones arranged atop the main one in a sort of crown. “There are books on Kannon, but not on images of the Six Kannon until now,” Fowler said. Fowler traces the arrangement of Kannon into groups of six back to the 11th century in Japan. By now, of course, many of these images have been destroyed or sets of them have been broken up, so her job was to do the “detective” work of tracking them down. In one example, she compared texts, poems and paintings of groups of six Kannon to an existing group of five sculptures to determine its missing member and relationship to six. “It’s something like tracking down a missing person,” she said. The Six Kannon pantheon grew to Seven when adherents disputed the proper identity of one of the group members. That later expanded to 33, Fowler said, “when it became associated with a pilgrimage route” among various temples. “Worshippers are physically involved in this geographic sphere of Kannon as they create merit by walking the route to say prayers in front of the statues along the way,” she said. Fowler spent many summers in Japan researching her book, visiting temples and museums, even falling off a mountainside while searching for a stone carving in the wild. Fowler will give lectures on her book this summer and fall at universities in Japan and the United Kingdom. She’ll also visit Korea in the summer to work on her next project – on temple bells. 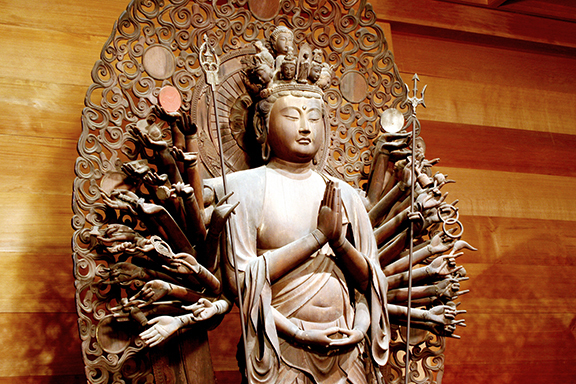 Image: Detail of a thousand-armed Kannon, dating to the year 1224, from a Japanese temple. Photograph by Sawada Naoyuki.